Do I need winter tires? I have 4 wheel drive, so I just use all season tires all year long. What are all weather tires? These are questions and statements that we get all the time here in Canada – especially in Edmonton. While every driver’s needs are different depending on the weather and road conditions they face throughout the year, in our climate it’s important to make sure you have tires that are appropriate for our extreme conditions. Read on to learn the difference between all season, winter and all weather tires to make sure you are making an informed purchase the next time you’re tire shopping. Most vehicles are fitted with all season tires when they leave the factory. These tires have gained popularity thanks to their good tread life, quiet ride, and year-round performance. All season tires are designed to help provide traction in both wet and dry conditions (including snow). However, in order to provide good performance in a variety of driving conditions, you can think of all season tires as a jack of all trades and a master of none. You won’t get the extreme grip and sharp handling of summer tires, and you won’t get the increased traction of winter tires. If you live in a moderate climate where you see minimal amounts of snow and ice during the winter, you will probably be fine leaving your all season tires on all year round. However, if you plan on having to deal with more extreme conditions, you’ll want to consider some other options. #1. 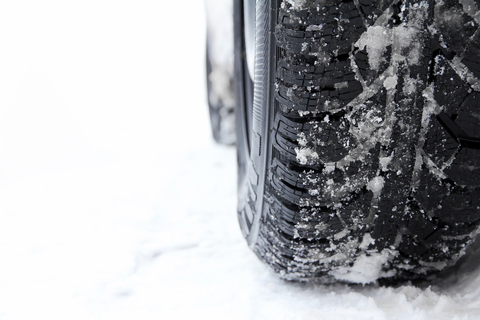 Tread Rubber: Winter tires are made of a softer compound than other tires that allow them to stick better to cold roads. #2. Tread Depth: Deeper treads and unique tread patterns help to reduce snow buildup and improve traction. #3. Biting Edges: Winter tires are equipped with thousands of tiny slits in the tread, called biting edges, which help to provide traction on ice. There is no doubt that winter tires outperform all season or all weather tires when it comes to stopping and traction control. However, these tires should not be left on year round, as warmer weather causes the soft rubber to wear faster and make it harder to stop. If you’re looking for increased confidence and control during the winter season, and you don’t mind swapping out your tires, winter tires are a great choice. Most people haven’t even heard of all weather tires. Relatively new to the market, think of these tires as a hybrid that combines the best of both all season and winter tires. A portion of the tire has all season treads, while some portions have the deeper treads of a winter tire. Because all weather tires are meant to be left on all year, you save yourself from the tire changeover and storage hassles, making it a clear choice for some drivers. Now before you go thinking these are the superior tire, it’s important to note that nothing will perform as well as a winter tire on snow and ice. However, all weather tires do outperform all season, so if you’re going to stick with one set of tires all year, all weather is the better choice. The downside to all weather tires is that they don’t last quite as long as the other types of tires due to their composition. Because all weather tires need to be able to withstand a wide range of temperatures, the treads wear down faster. Ultimately, the solution to which tires are right for you will depend on where you live and the conditions in which you drive. For help choosing the right set of tires, call or visit the team at Park Muffler today.